The following is a guest post by Wesley Yu at Sendwithus. Learn more about Wesley at the bottom of this post. With so many products on the market, keeping customers engaged with your company is getting harder than ever. Customers sign up, they’ll use your product for a while, then they’ll churn. Sometimes churn happens when your company just slips their mind – they forgot about you – other times it happens because they never really experienced the “AH-HA” moment – the moment when your product just clicks and works in their mind. Notification emails bridge that gap. They keep your company top of mind, and they nudge customers closer to that “AH-HA” moment. 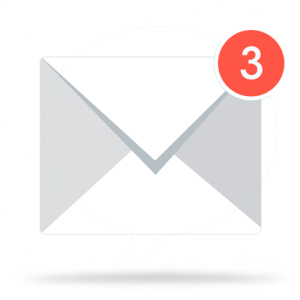 Notifications emails focus on retention, increasing the lifetime value of your customers and setting them up to be your best marketing tool down the road. It’s always easier to keep existing customers than it is to find new ones, so keeping customers engaged with your product or service will generally be cheaper than pouring more leads in at the top of the funnel. In fact, according to Harvard Business School, even just a 5% increase in retention translates into a 25-95% increase in profit. So, How Do Notification Emails Work? 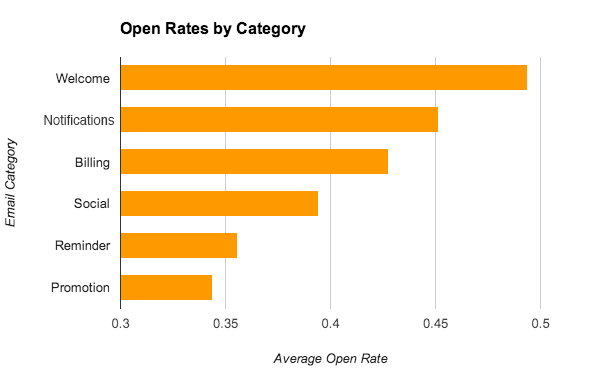 Second to welcome emails, notifications get the highest open-rate compared to all other email categories. Notification emails stand out in a user’s inbox because the content in a notification is tied directly to what’s happening on their account. Check out our blog post on transactional email data. Similar to push notifications, email notifications are real-time update emails that can be triggered for any number of reasons. They can happen if a user has a new friend or follower, if someone’s messaged them or commented on their post, or any other activity that happens within your product. These notifications give users meaningful information and they loop customers back into the product, keeping them engaged with your company. Another reason why notification emails are such a successful retention strategy is because they can play into a user’s vanity. People like seeing new followers, and comments, and who’s checked out their profile. Yes–it’s narcissistic, but it gets me excited to sign back into the product to see all the new friends I’ve made. As you’ve probably noticed, social networks have been using these kinds of notifications as a way to retain users for a long time now. In the early days of Twitter, Josh Elman, the former growth lead, realized that to continue growing the company, he had to keep users from leaking out of the service. Twitter couldn’t just keep throwing users in at the top the funnel–they needed a way to retain users for the long haul and keep them from churning. By looking at his regular active users, Elman found a pattern. He realized that “once a user follows 30 people, they’re more or less active forever.” By quantifying the point at which a user is officially “retained,” Elman was able to create an email notification that promoted that behavior. You’ll more than likely recognize this email. 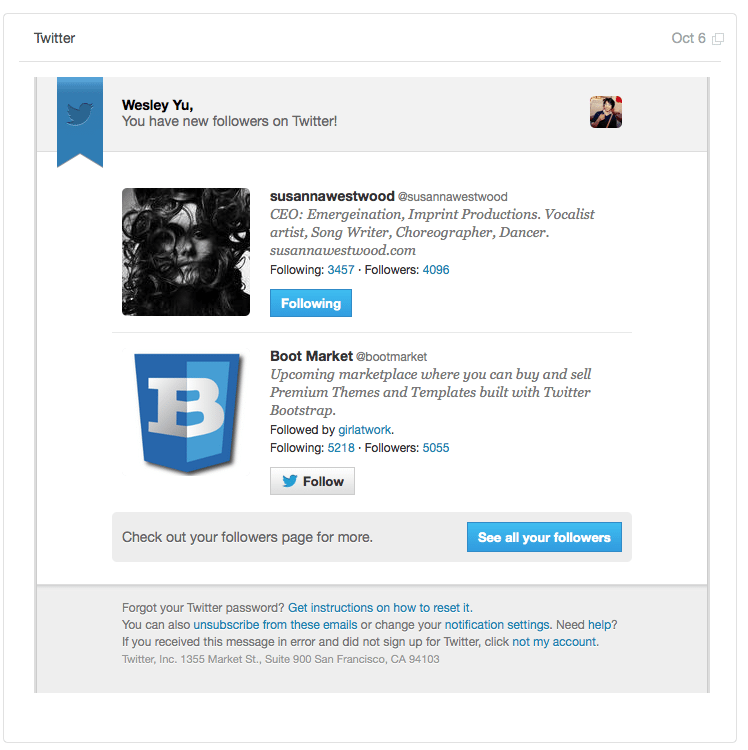 When someone follows you on Twitter, you get this email notification telling you that you have a new follower. 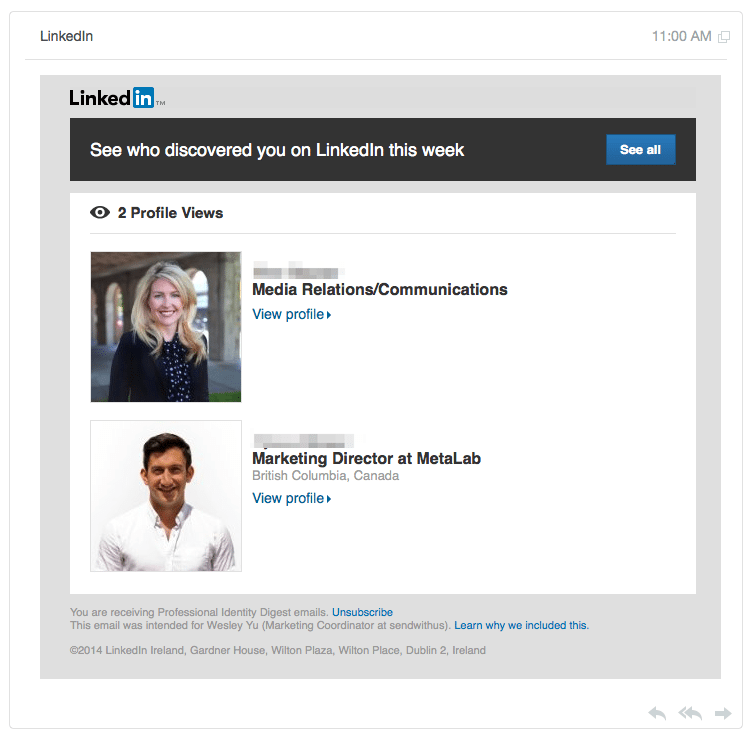 LinkedIn uses a similar strategy to boost their product’s retention. Their “who’s viewed your profile” notification loops users back into the product and encourages users to view and add new contacts on the service. Both these emails promote a very specific user behavior: add a friend. The notification emails your company sends should also promote a specific user behavior. Choosing which behavior to target is the tricky part. Before choosing a behavior to promote in your notification emails, you need to determine the one thing your customers need to do in order to understand and receive value from your product. Similar to the “AH-HA” moment, this is the point when your customers “get” your product and they can start using it on a regular basis. Choose a quantifiable metric that correlates with customer retention and promote that behavior with your email notifications. For more retention strategies and examples using transactional email, check out The Pirates Guide to Email by Sendwithus. 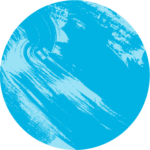 Wesley Yu is a digital marketing strategist working in Victoria, BC. He runs content for Sendwithus, an easy way for marketers to manage their email templates. For more of his writing visit the Sendwithus Blog or follow him on Twitter @wesleycyu.